Kamron Fields and the Texas baseball team had a bottom of the ninth to forget as TCU topped the Longhorns 3-2 in Fort Worth on Friday night. Johnny Rizer hit an RBI single to score pinch runner Brad Czerniejewski to end the game. Rizer also had the top play on SportsCenter’s Top 10 with a catch to rob Zach Zubia of a two-run homer in the fourth inning. Fields (1-1) entered the contest with a two-run lead after Bryce Elder shut out the Horned frogs through eight innings. Elder hit Alex Isola to start the ninth and end his outing with a chance for the win. Fields started by issuing a walk to Jake Guenther. Two wild pitches later made it 2-1 with no outs. After a walk, back-to-back singles gave TCU (14-6) the win. Elder left the game having allowed one run on five hits through eight innings. He struck out seven. Michael McCann went 2-for-3 for Texas (16-9, 2-2 Big 12), accounting for the Longhorns’ only extra-base hit. McCann also had the only RBI for Texas in the top of the ninth. His sacrifice fly that scored Ryan Reynolds looked like an insurance run that would help the Longhorns take the win. Earlier in the eighth, Duke Ellis accounted for the Longhorns’ other run as he made it home on a double-steal. Eric Kennedy took second base on the two-out play. Ellis had been called out, but the play was reversed upon video review. Rizer finished the game 2-for-4 with an RBI. Adam Oviedo also went 2-for-4 and drove in a run for TCU (14-6, 1-0). Nick Lodolo had a strong start for TCU in the pitchers’ duel. He gave up one run while striking out nine through eight innings. Marcelo Perez (1-0) picked up the win as he gave up a run while walking two and throwing a wild pitch. 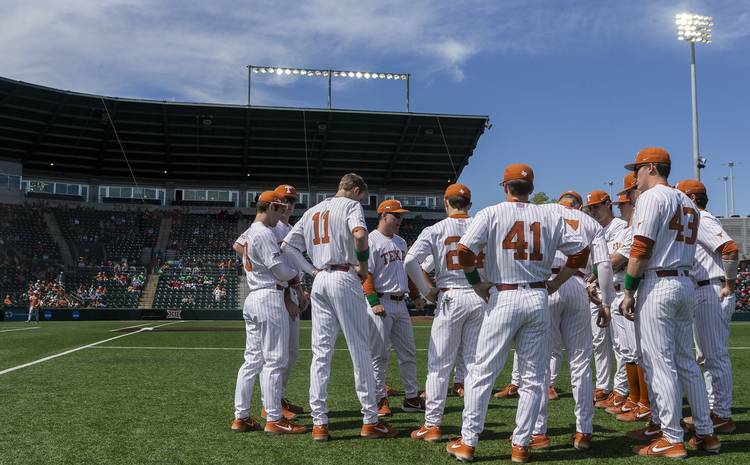 The Texas baseball squad will try to even the series Saturday at 7:30 p.m.